Usimare Ramesses III (also written Ramses and Rameses) was the second Pharaoh of the Twentieth Dynasty. He is considered to be the last monarch of the New Kingdom to wield any substantial authority over Egypt. His long reign saw the decline of Egyptian political and economic power, linked to a series of invasions and internal economic problems. Ramesses III was the son of Setnakhte and Queen Tiy-Merenese. He was assassinated in the Harem Conspiracy led by one of his secondary wives, Tiye, her son Pentawer, and a group of high officials. Philae is an Egyptian island located in Lake Nasser. During ancient Egyptian times, Philae was the cult center of Isis. It measures only about 1,500 feet by 500 feet. Due to its vulnerability to flooding, high walls with granite foundations were constructed around the island and its temples. 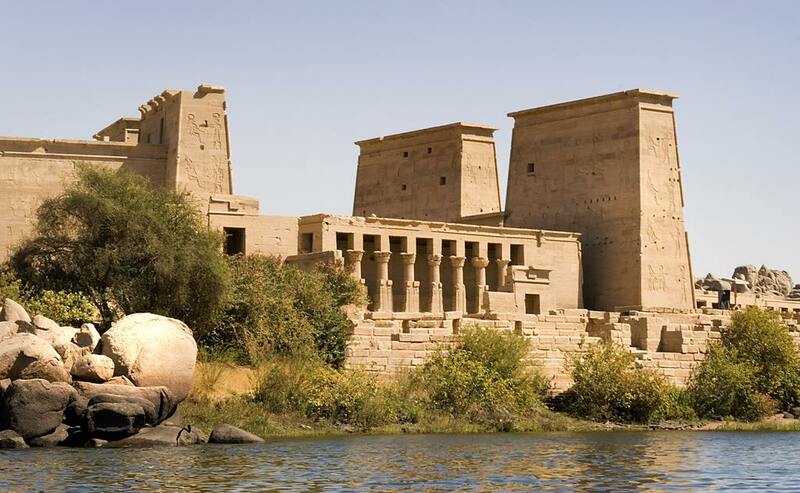 The nearby construction of the High (Aswan) Dam in 1970 left the island of Philae and its temples defenseless against flood waters all year round. 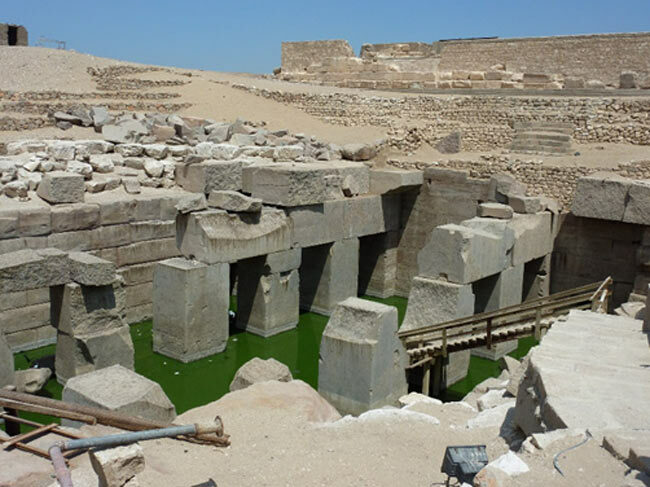 UNESCO performed a “rescue mission” to move the island’s temples from Philae to a drier, more stable island nearby called Agilika. 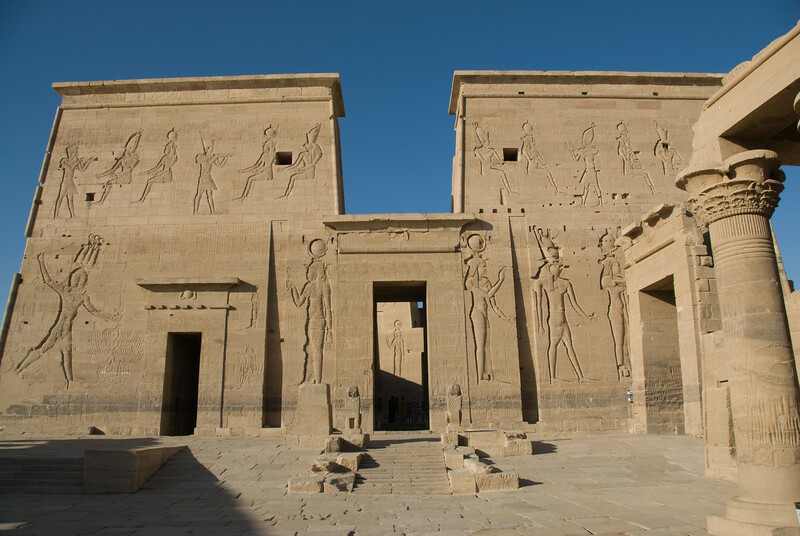 Although there are several temples and buildings located on Philae, the largest and perhaps the most famous is the Temple of Isis. Here, the ancient Egyptians worshiped Isis as well as Osiris and Horus (her son). Ptolemy II, Nectanebo I built the temple around 370 BC. Gate of Ptolemy II: Two pink granite lions stand in front of the first pylon by this gate. Two pink granite obelisks at one time joined the lions together. These obelisks are significant because the hieroglyphs found on the base of the obelisks were compared to the Rosetta stone, and were instrumental in deciphering the Egyptian consonantal alphabet. First Pylon: Reliefs and inscriptions are abundant in the Temple of Isis. For example, on the eastern tower of the first pylon, Dionysus is depicted as holding the enemies of Egypt by the hair while raising his club. 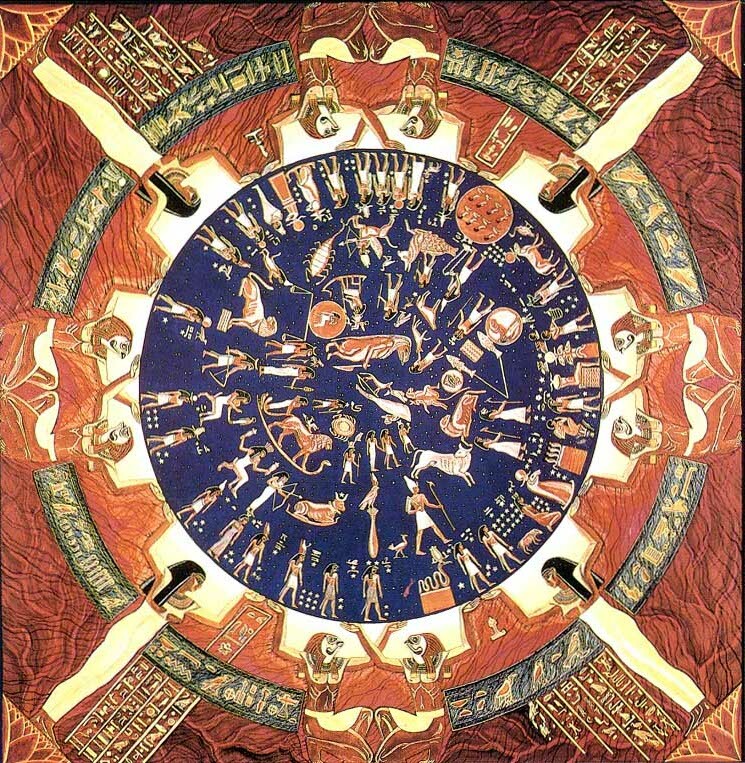 Others in the scene include Hathor, Horus and Isis. Above this menacing depiction there are two smaller scenes. One is of the pharaoh offering his crown to Horus and Nephths, and one is of the pharaoh offering incense to Isis and Horus as a child. Birth House: A common feature in Ptolemaic temples, the Birth House in the Temple of Isis depicts Horus as a hawk wearing a double crown standing among papyrus. There is also a relief of Isis carrying a newborn Horus in her arms while being protected by Wadjet, Nekhbet, Amun-Ra, and Thoth. Here, the king conducted rituals to validate his descendancy from Horus. Second Pylon: The Western Tower depicts Ptolemy XII offering animals and incense to various gods including Hathor and Horus. 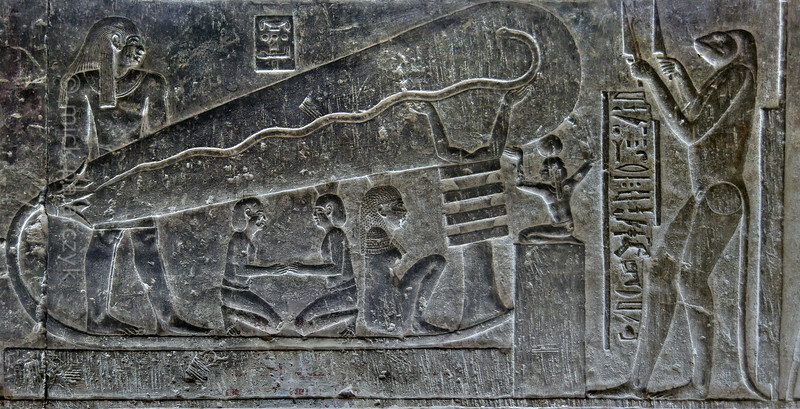 Also depicted is the king offering flowers to Nephthys and Horus, and another of the king pouring water and presenting incense on an altar while in the presence of Horus, Isis and Osiris. A piece of granite along the Eastern Tower called a stele is carved of Ptolemy VI Philometor standing with Cleopatra II and Isis and Horus. The inscription is notable because it contains what is known as the grant of the Dodekaschoinoi, which lays claim to the land needed for the temple. 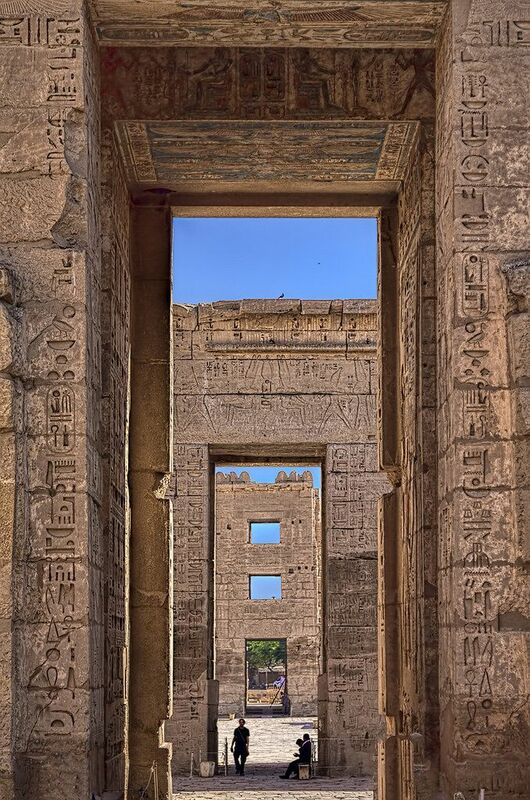 Inner Courtyard: A Hypostyle hall stands through a gateway from the second pylon. Ten columns remain here and all are painted to look like and represent a variety of the first flowers and plants. The floor represented the primeval mound and the ceiling the sky, with images of the Day Boat (Madjet) and the Night Boat (Semektet). Sanctuary: Through the Inner Courtyard is Isis’ Sanctuary. The actual sanctuary is a small chamber with two windows. A pedestal, placed here by Ptolemy III Euergetes I, remains today. It bears the image of Isis in her sacred barque (boat). Nectanebo’s Kiosk is a pillared, roofless hall that originally had 14 columns, of which six remain. The walls of this vestibule are decorated with reliefs of the king sacrificing various items to the gods. Screen walls of the Kiosk are connected by Hathor columns and topped with uraei (serpentine) carvings. Built by Ptolemy VI Philometor and Ptolemy VIII Euergetes II, the Temple of Hathor consists of a colonnade hall and a forecourt. Augustus decorated the hall to honor Isis and Hathor with depictions of festivals. Augustus is also depicted as presenting gifts to Isis and Nephthys. At The Temple of Hathor at Philae, the ancient Egyptians drank, ate and danced to music played by Bes (Dwarf God of humor, dancing and music) and his harp and tambourine. 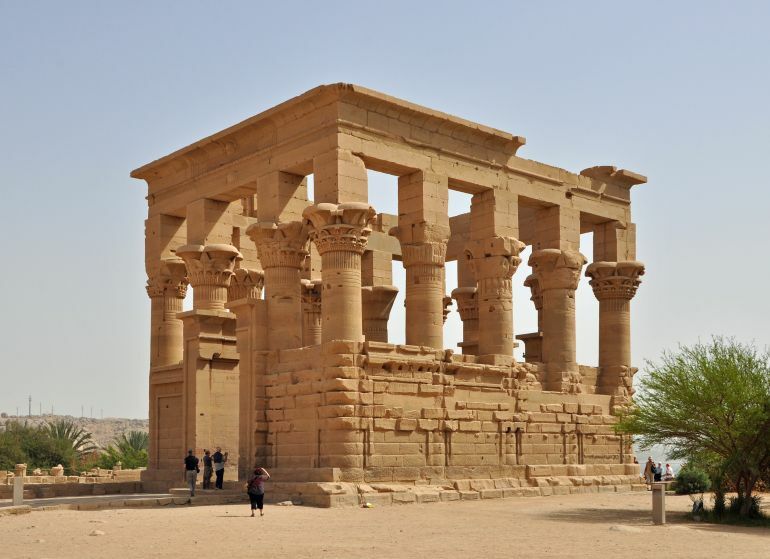 Considered by many to be the most appealing structure on Philae, Trajan’s Kiosk is today a roofless structure. In ancient Egyptian times, it was likely roofed and used as a shelter for Isis’ barque at the eastern banks. It is sometimes referred to as the “Pharaoh’s Bed”; Trajan was a Roman Emperor but the kiosk itself likely dates back to earlier times. It is heavily decorated with reliefs of Trajan burning incense to honor Osiris and Isis, while also offering wine to Isis and Horus. The island of Philae has much to offer with not just the Temple of Isis but also the Temple of Hoe-Anhur, and the Temple of Augustus. There are also chapels dedicated to Mandulis (the Sun God of Lower Nubia) and Imhotep (a commoner who achieved divine status after death, he was vizier to Djoser). Nefertari, also known as Nefertari Meritmut, was an Egyptian queen and the first of the Great Royal Wives (or principal wives) of Ramesses the Great. 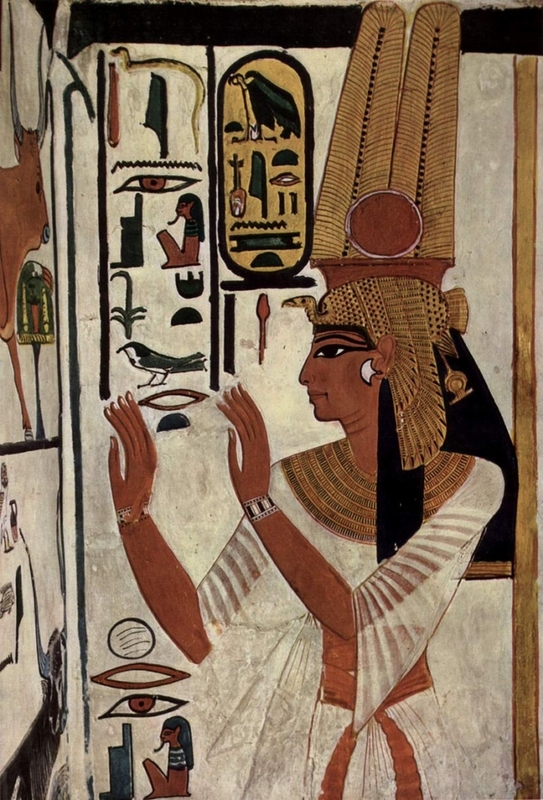 Nefertari means ‘beautiful companion’ and Meritmut means ‘Beloved of [the goddess] Mut’. She is one of the best known Egyptian queens, next to Cleopatra, Nefertiti, and Hatshepsut. She was highly educated and able to both read and write hieroglyphs, a very rare skill at the time. She used these skills in her diplomatic work, corresponding with other prominent royals of the time. Her lavishly decorated tomb, QV66, is one of the largest and most spectacular in the Valley of the Queens. Ramesses also constructed a temple for her at Abu Simbel next to his colossal monument there. 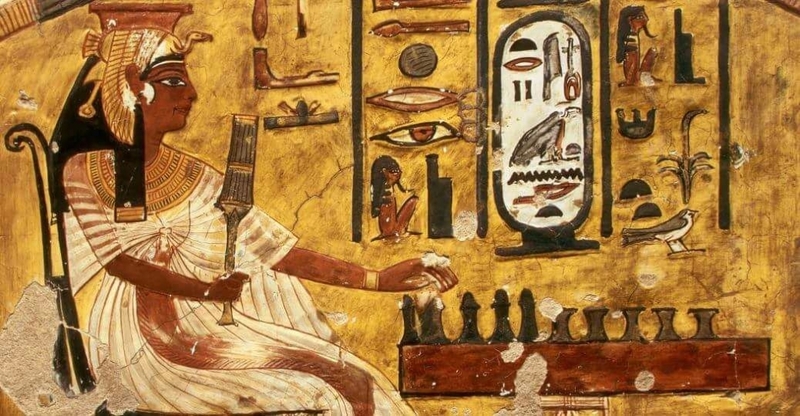 Nefertari held many different titles, including: Great of Praises (wrt-hzwt), Sweet of Love (bnrt-mrwt), Lady of Grace (nbt-im3t), Great King’s Wife (hmt-niswt-wrt), his beloved (hmt-niswt-wrt meryt.f), Lady of The Two Lands (nbt-t3wy), Lady of all Lands (hnwt-t3w-nbw), Wife of the Strong Bull (hmt-k3-nxt), god’s Wife (hmt-ntr), Mistress of Upper and Lower Egypt (hnwt-Shm’w-mhw). Ramesses II also named her ‘The one for whom the sun shines’. Nefertari, or Beautiful Companion, was the first and most beloved of the wives of Ramses 11. Indeed, her form is slim and graceful, and she is extremely fair. Since her magnificent tomb in the Valley of the Queens at Luxor is closed to the general public, we are fortunate that we can see her depicted in her temple at Abu Simbel. It lies to the north of the great temple of Ramses II and is dedicated to Nefertari and to the goddess Hathor. The terrace (1) leads to the sloping facade that provides the frame for six recesses, three on each side of the central doorway. Within each there are standing figures: four of the king and two of the queen. They appear to be walking forward with spirited strides. Ramses wears an elaborate crown of plumes and horns. On Nefertari’s head are plumes and the sun disc. At their sides are small figures of their children – the princesses beside Nefertari and the princes beside Ramses. The legend of the love of Ramses for his wife is enumerated along with his titles: ‘Ramses, strong in Maat (Truth), beloved of Amon, made this divine abode for his royal wife, Nefertari, whom he loves’. Throughout the temple, on pillar and wall, and even in the sanctuary, the names of the royal couple are linked in their shared dedication to the goddess Hathor. The buttressed sloping projections between the figures on the facade bear hieroglyphic votive inscriptions. At the centre of the broadest, central section is the doorway leading to the Hypostyle Hall (2), a traverse chamber (3) and the sanctuary (4). The thickness of the doorway shows Ramses before Hathor, to the south, and Nefertari before Isis, to the north; Isis makes a gesture as though to crown her. The Hypostyle Hall (2) has six pillars decorated on the front with sistra-the musical instrument associated with the goddess Hathor and with the heads of Hathor. 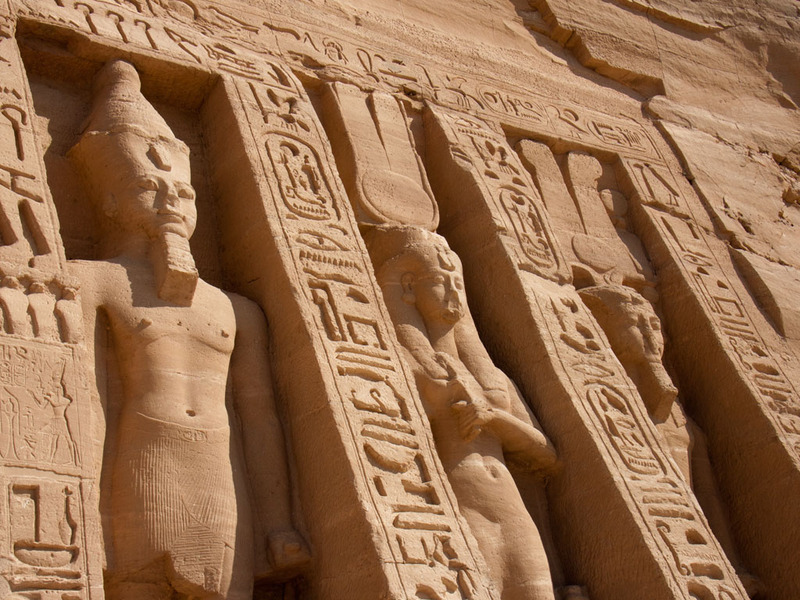 Behind are representations of Ramses, Nefertari and various deities. The reliefs on the entrance walls (a) and (b) have fine representations of Ramses, accompanied by Nefertari, smiting a Libyan in the presence of Ra-Harakhte, and a Nubian in the presence of Amon-Ra respectively. The side walls have similar offering scenes. At (c) Ramses offers food to Ptah and also stands in front of the ram-headed Harshef. Nefertari makes offerings to Hathor. And Ramses offers wine to Ra-Harakhte. At (d) Ramses stands before Hathor. 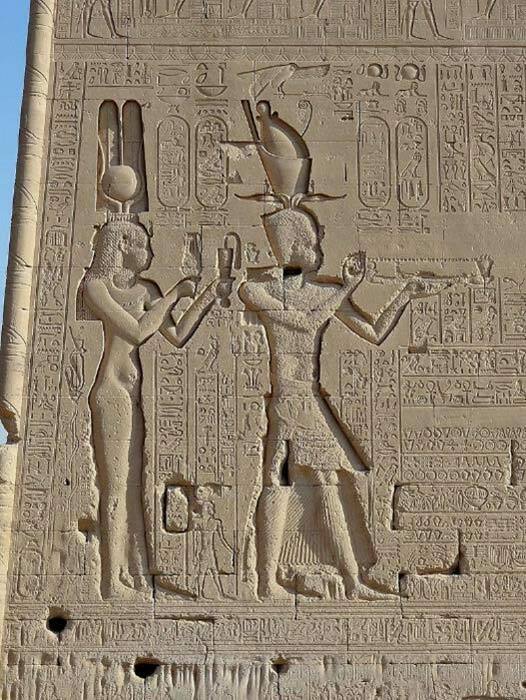 Ramses is blessed by Horus and Set of Nubt. Nefertari stands before Anukis. 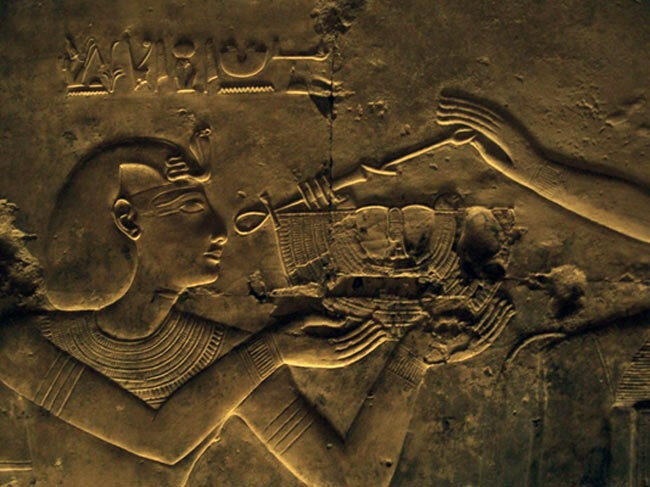 And Ramses presents an image of Maat to Amon. 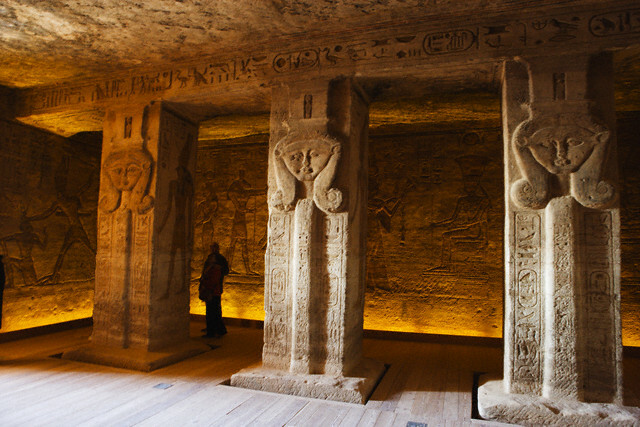 On the rear walls are Nefertari and Hathor (to the right) and Nefertari and Mut (to the left). Mut was the wife of Amon-Ra and, like Hathor, a mother figure. The traverse chamber (3) is adjoined by two unfinished chambers, to the right and left. Over the doorways, however, are reliefs of Hathor the sacred cow in a marsh, which are worth noting. 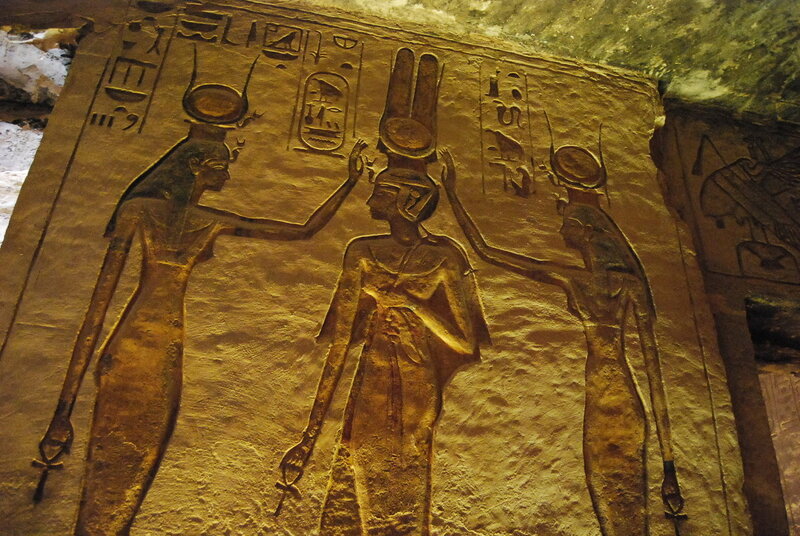 In one case, Hathor is being worshipped by Ramses and in the other by Nefertari. The sanctuary (4) has a recess to the rear, and the roof is supported by sistra. A representation of Hathor in the form of a cow protecting the king (who appears below her head) is a fine relief. 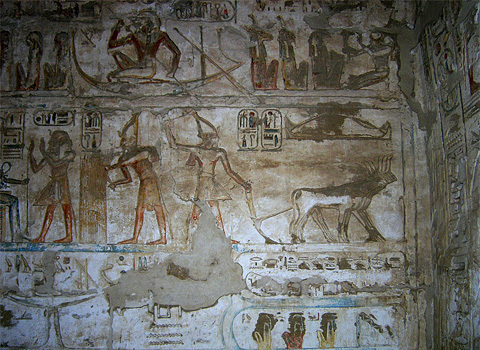 On the right-hand wall Nefertari offers incense to Mut and Hathor. On the left the king pours a libation over his own image and also that of his wife. 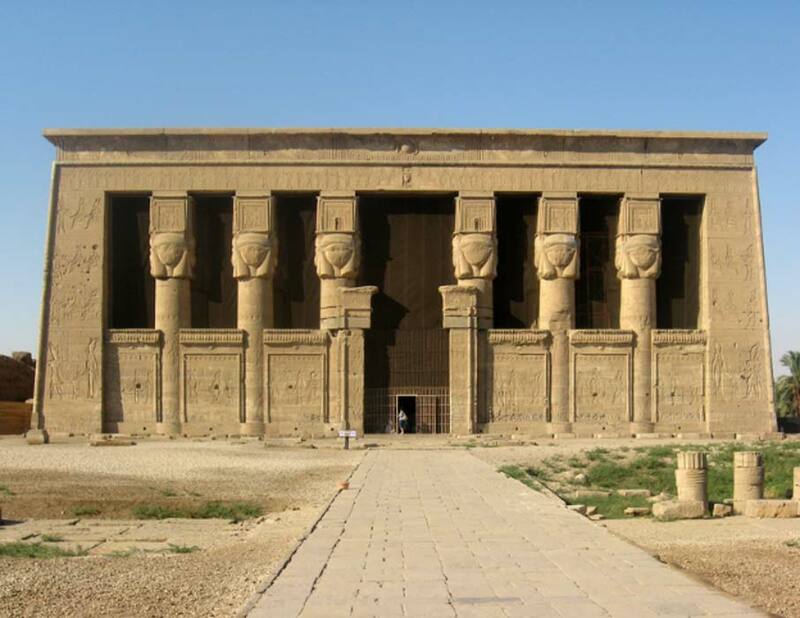 The all overshadowing building in the Dendera Temple Complex is the main temple, namely Hathor temple (historically called the Temple of Tentyra). The temple has been modified on the same site starting as far back as the Middle Kingdom, and continuing right up until the time of the Roman emperor Trajan. The existing structure was built no later than the late Ptolemaic period. 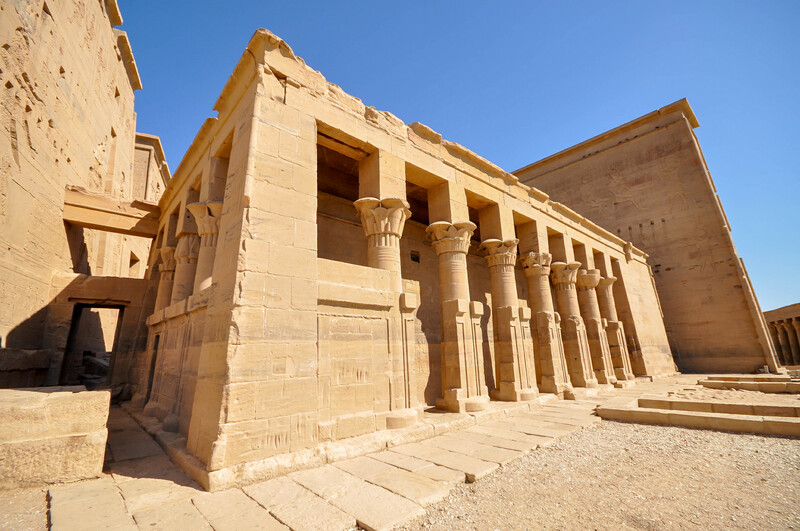 The temple, dedicated to Hathor, is one of the best preserved temples in all Egypt. Subsequent additions were added in Roman times. Depictions of Cleopatra VI which appear on temple walls are good examples of Ptolemaic Egyptian art. On the rear of the temple exterior is a carving of Cleopatra VII Philopator (the popularly well known Cleopatra) and her son, Ptolemy XV Philopator Philometor Caesar (Caesarion), fathered by Julius Caesar. Hathor was a major goddess in the ancient Egyptian pantheon, who personified the principles of joy, feminine love, and motherhood, and her cult center was at Dendera, one of the best-preserved temple complexes in all of Egypt. The Temple of Hathor is the largest and most impressive buildings in this religious complex, and is visually stunning with its grand entrance, detailed carvings, hieroglyphs, and decorated ceilings. The city of Dendera is located on the west bank of the Nile, about 60 km ( miles) to the north of Luxor, in the 6th Nome of Upper Egypt. 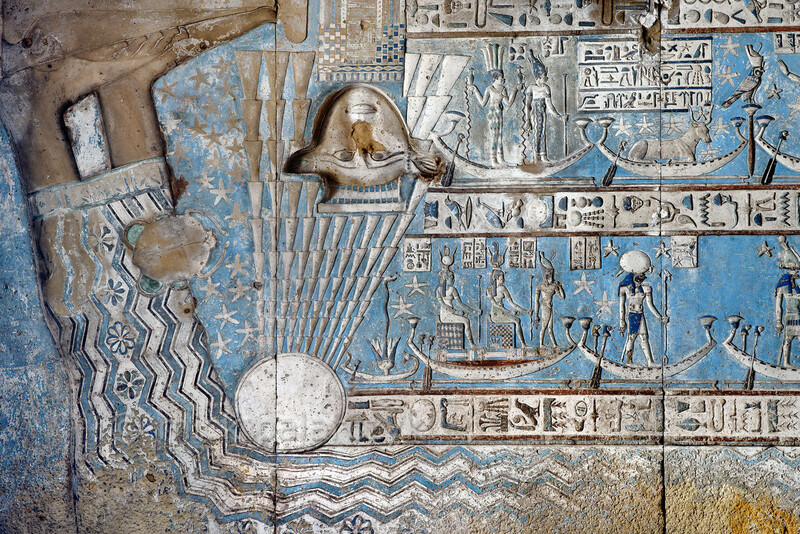 The Dendera Temple Complex is situated around 2.5 km ( miles) to the southeast of this city. 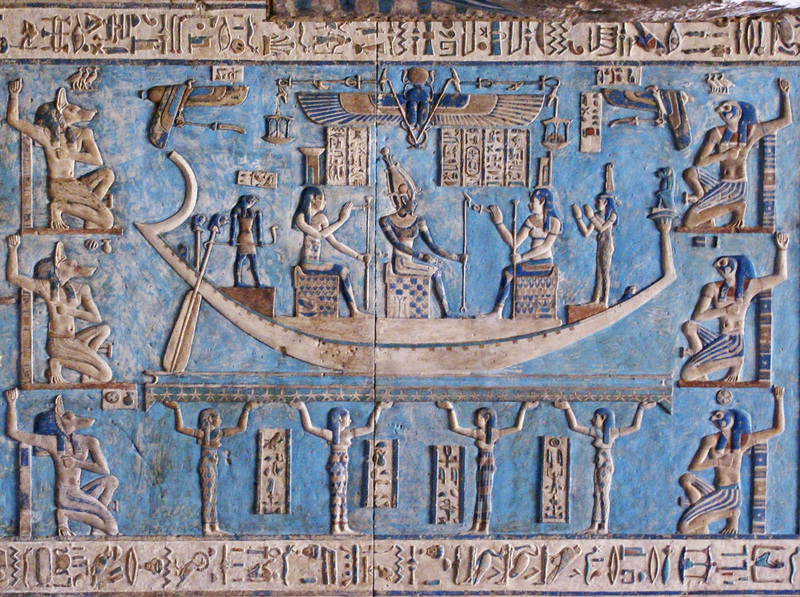 Dendera is said to mark an old holy place, even by the standards of the ancient Egyptians. 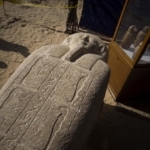 It has been pointed out that there is evidence for religious structures built at the site during the reign of the Old Kingdom Pharaoh Pepi I (towards the end of the 3rd millennium BC). 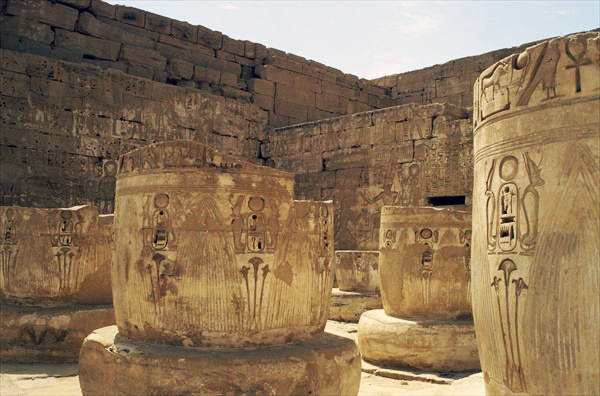 There are also remnants of a temple that was built during the New Kingdom, specifically the 18th Dynasty. The current complex, including the Temple of Hathor, however, dates to the Ptolemaic and Roman periods, with (at least) one building dating to the Late Period. This is the mammisi (birth house) of Nectanebo II, the last native ruler of ancient Egypt who ruled during the 4th century BC. 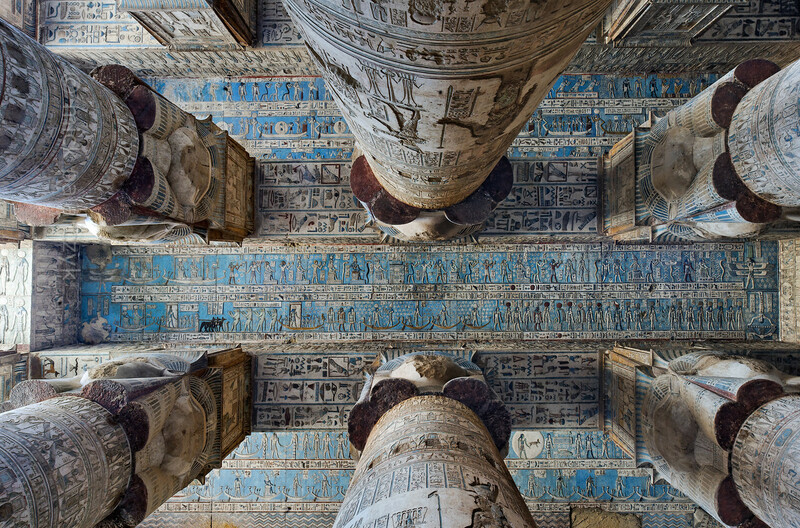 The Dendera Temple Complex covers an area of 40,000 square meters ( sq. ft.), and is surrounded by a large mudbrick wall. Within this enclosure are various structures, including the Temple of the Birth of Isis, a Roman mammisi (attributed either to the reign of Trajan or Nero), a sanatorium, and a sacred lake. It was made famous by a carving that many believe depicts an electrical lightbulb. Nevertheless, the most impressive part of the temple complex is undoubtedly the Temple of Hathor. 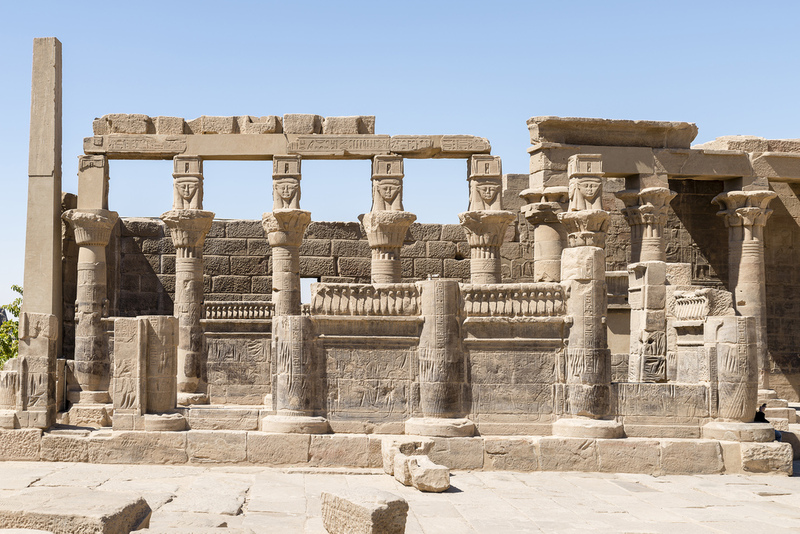 Like the native Egyptian pharaohs before them, the Ptolemaic and Roman rulers of Egypt also used the temple complex as a means of propaganda, and to showcase their piety towards the gods of Egypt. Thus, for instance in the hypostyle hall of the Temple of Hathor, there is a depiction of the Roman Emperor Nero offering a model of the mammisi to the goddess. This image has been cited as evidence that Nero was involved in the construction of the Roman birth house. On the other hand, the dedication inscriptions and decorations in the birth house itself make reference to Trajan, thus suggesting that it was this emperor who was responsible for its construction. Sources: Wikipedia (wikipedia.org), Ancient Origins (ancient-origins.net). Images sources: pinterest, paulsmit.smugmug,google-images. Dendera Temple complex (Ancient Egyptian: Iunet or Tantere; the 19th-century English spelling in most sources, including Belzoni, was Tentyra) is located about 2.5 kilometres (1.6 mi) south-east of Dendera, Egypt. 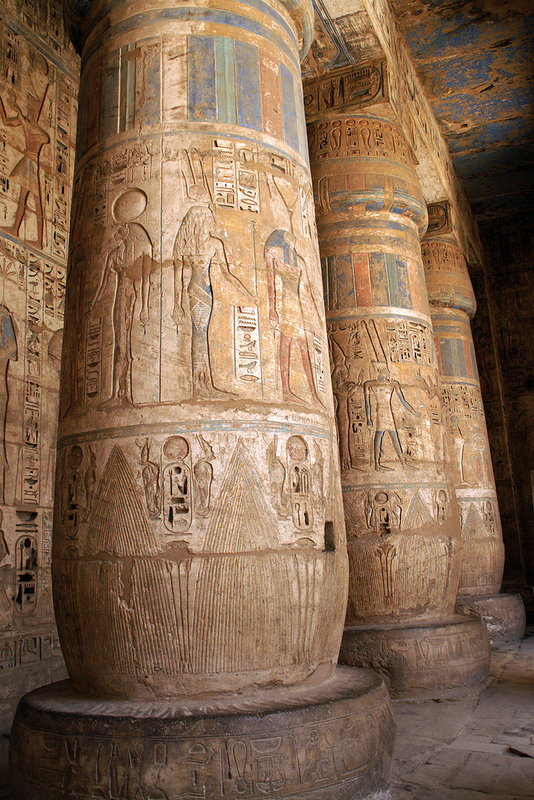 It is one of the best-preserved temple complexes in Egypt. The area was used as the sixth Nome of Upper Egypt, south of Abydos. 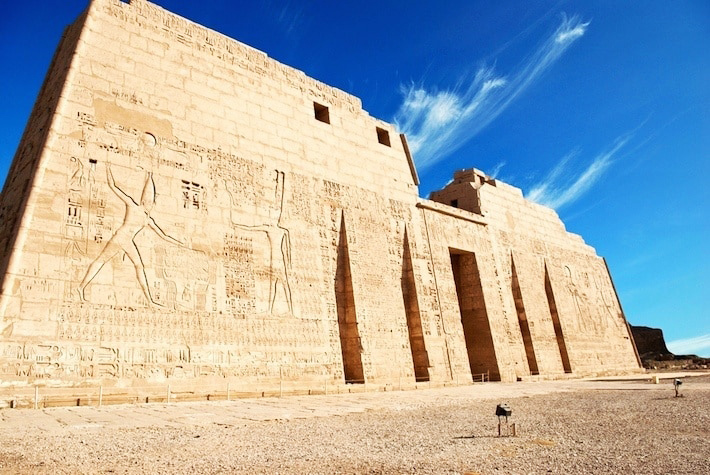 Visitors to Luxor, who have the time, should try and visit the famous Temple of Hathor at Dendera. In a taxi, the trip takes about 1hour from Luxor. The buses, which are always accompanied by a Police convoy, that leaves at 0800 daily . The entrance fee is LE 35. The Temple is located about 4KM from the River Nile, on its west bank, roughly opposite the city of Qena, the capital of the province and governorate of Qena (population – 2,000,000), which is inhabited by both Coptic and Muslims. This town is very famous for the manufacture of water pots, called “gula” jars in Arabic. The Muslim Sheik, Abdel Raheeem El-Kenawi, who spent all of his life in this town and died in 1170 A.D, founded the modern city. The birthday of this saint is celebrated every year, and a great number of pilgrims come from all over Egypt for the festivities. The name of the city goes back to the time of the Pharaohs , and was taken from the ancient Egyptian word Qeny, which means, “to bend”; the River Nile has a huge (and famous) bend here. The Temple of Hathor was built in the 1st century B.C and it is one of the best-preserved Temples in the whole of Egypt! Ptolemy VIII and Queen Cleopatra II built it, and then later, Roman Emperors continued to decorate it and honour the Goddess Hathor; the Goddess of maternity, love and music. The Greeks identified the Goddess Hathor as Aphrodite. The first gateway, built by Roman Emperor Domitian in 80 A.D, leads to the great hall of the Temple, which is decorated with Hathoric columns (columns with the face of Hathor on them) and is in a very good condition. The upper, front edge of the cornice is decorated with the winged sun disc, while stone screens between the columns and the scene, which represent the Roman Emperor Tiberius and other Roman rulers who present votive offerings to the Goddess of the Temple, enclose the front portion. Hathor is chiefly represented with the horns of the sacred cow protruding from her head, supporting the solar disc of the sun, and in her hands she is holding an “Ankh”, the symbol of life, and a sceptre. Sometimes she is also represented with the head of a cow. The third one is the western ceiling, which shows a perfect representation of the zodiac signs, which is one of the reasons that the Temple is so famous (the original zodiac relief is now in the Louvre museum in Paris, France). The 12 figures of the ram, the bull, the heavenly twins, the crab, the lion, the virgin, the scales, the scorpion, the archer, the goat, the watering pots and fishes with glittering tails. On the inner walls of the screen, the hawk headed God Horus, and the Ibis headed God Thoth, are pouring drops of holy water over the King. This scene is called the baptism scene, symbolising life and happiness. The second hall has 6 columns adorned with rich capitals and granite pedestals. On both sides of this hall are small rooms that were used as storerooms, used to store the wine jars that came from the Island of Crete, and the fertile Fayoum and Kharga oases. There is a small corridor on the right, which leads to a small room that contains the crypt, highly recommended should you visit here. The staircases, which lead to the roof of the Temple, are decorated with some beautiful symbols representing the 12 months of the year. On the eastern corner, of the roof, is the chapel of the God Osiris. 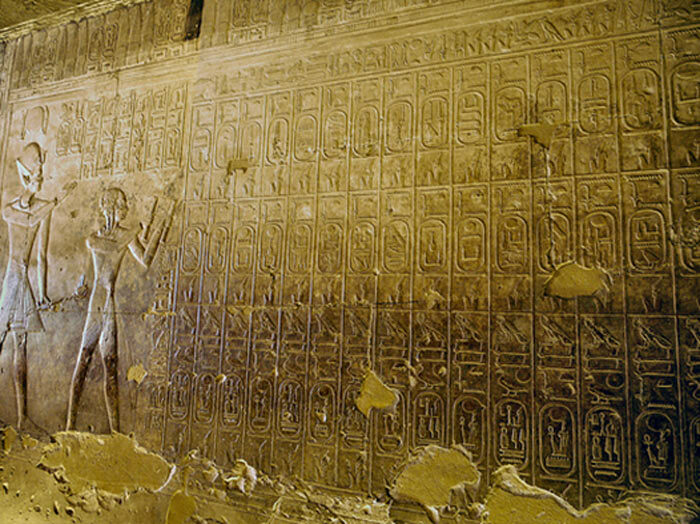 The scenes on its walls represent Osiris rising from the dead and becoming the God of the underworld. It is from this chapel that the best representation of the zodiac was taken. The southern exterior wall relief show Cleopatra VII and her son Caesarian, son of JuliusCaesar, making offerings to Hathor and allthe other deities of Dendera. On the same wall, near the cornice, are some stone lion heads, serving as water spouts. Adjoining the Temple building to the west is the sacred lake, which was used for the priests’ ablutions. Next to the lake is a small shaft, discovered in 1917, which contained valuable treasures of Cleopatra’s era, which are now displayed in the Egyptian Museum. 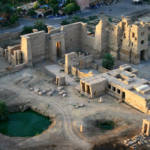 Around the Temple are the remains of the mud brick wall, which surrounded the whole Temple, as well as the ruins of Coptic houses and churches, including a large number of Coptic crosses, which were chiseled into the stones. To the north lies the Mamisi, the birth house of Horus, the son of Isis and Osiris, which was erected by the Roman Emperor Trajan in 90 A.D. This little Temple is surrounded by a row of columns, with different capitals embellished with relief images of the God Bes, the chief God of childhood who drove evil spirits away from the babies. Bes is a hideous dwarf, with a big stomach and long whiskers. Sources: Wikipedia (wikipedia.org), ask-aladdin (www.ask-aladdin.com). There are many examples of these great monuments and temples throughout Egypt from the pyramid complex at Giza in the north to the temple at Karnak in the south. Among these, the mortuary temple of Queen Hatshepsut (1479-1458 BCE) at Deir el-Bahri stands out as one of the most impressive. The building was modeled after the mortuary temple of Mentuhotep II (c. 2061-2010 BCE), the great Theban prince who founded the 11th Dynasty and initiated the Middle Kingdom of Egypt (2040-1782 BCE). Mentuhotep II was considered a ‘second Menes’ by his contemporaries, a reference to the legendary king of the First Dynasty of Egypt, and he continued to be venerated highly throughout the rest of Egypt’s history. The temple of Mentuhotep II was built during his reign across the river from Thebes at Deir el-Bahri, the first structure to be raised there. It was a completely innovative concept in that it would serve as both tomb and temple. The king would not actually be buried in the complex but in a tomb cut into the rock of the cliffs behind it. The entire structure was designed to blend organically with the surrounding landscape and the towering cliffs and was the most striking tomb complex raised in Upper Egypt and the most elaborate created since the Old Kingdom. Hatshepsut, an admirer of Mentuhotep II’s temple had her own designed to mirror it but on a much grander scale and, just in case anyone should miss the comparison, ordered it built right next to the older temple. Hatshepsut was always keenly aware of ways in which to elevate her public image and immortalize her name; the mortuary temple achieved both ends. It would be an homage to the ‘second Menes’ but, more importantly, link Hatshepsut to the grandeur of the past while, at the same time, surpassing previous monumental works in every respect. As a woman in a traditionally male position of power, Hatshepsut understood she needed to establish her authority and the legitimacy of her reign in much more obvious ways that her predecessors and the scale and elegance of her temple is evidence of this. She commissioned her mortuary temple at some point soon after coming to power in 1479 BCE and had it designed to tell the story of her life and reign and surpass any other in elegance and grandeur. The temple was designed by Hatshepsut’s steward and confidante Senenmut, who was also tutor to Neferu-Ra and, possibly, Hatshepsut’s lover. Senenmut modeled it carefully on that of Mentuhotep II but took every aspect of the earlier building and made it larger, longer, and more elaborate. Mentuhotep II’s temple featured a large stone ramp from the first courtyard to the second level; Hatshepsut’s second level was reached by a much longer and even more elaborate ramp one reached by passing through lush gardens and an elaborate entrance pylon flanked by towering obelisks. Walking through the first courtyard (ground level), one could go directly through the archways on either side (which led down alleys to small ramps up to the second level) or stroll up the central ramp, whose entrance was flanked by statues of lions. On the second level, there were two reflecting pools and sphinxes lining the pathway to another ramp which brought a visitor up to the third level. The first, second, and third levels of the temple all featured colonnade and elaborate reliefs, paintings, and statuary. The second courtyard would house the tomb of Senenmut to the right of the ramp leading up to the third level; an appropriately opulent tomb placed beneath the second courtyard with no outward features in order to preserve symmetry. All three levels exemplified the traditional Egyptian value of symmetry and, as there was no structure to the left of the ramp, there could be no apparent tomb on its right. As the daughter of the most powerful and popular god in Egypt at the time, Hatshepsut was claiming for herself special privilege to rule the country as a man would. She established her special relationship with Amun early on, possibly before taking the throne, in order to neutralize criticism of her reign on account of her gender. The Punt Colonnade related her glorious expedition to the mysterious ‘land of the gods’ which the Egyptians had not visited in centuries. Her ability to launch such an expedition is a testimony to the wealth of the country under her rule and also her ambition in reviving the traditions and glory of the past. 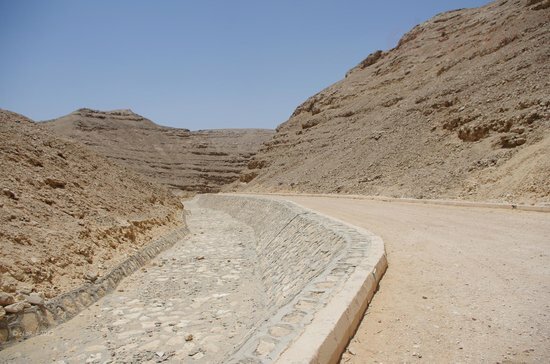 Punt was known to the Egyptians since the Early Dynastic Period (c. 3150 – c. 2613 BCE) but either the route had been forgotten or Hatshepsut’s more recent predecessors did not consider an expedition worth their time. At either end of the second level colonnade were two temples: The Temple of Anubis to the north and The Temple of Hathor to the south. As a woman in a position of power, Hatshepsut had a special relationship with the goddess Hathor and invoked her often. A temple to Anubis, the guardian, and guide to the dead, was a common feature of any mortuary complex; one would not wish to slight the god who was responsible for leading one’s soul from the tomb to the afterlife. The ramp to the third level, centered perfectly between the Birth and Punt colonnades, brought a visitor up to another colonnade, lined with statues, and the three most significant structures: the Royal Cult Chapel, Solar Cult Chapel, and the Sanctuary of Amun. The whole temple complex was built into the cliffs of Deir el-Bahri and the Sanctuary of Amun – the most sacred area of the site – was cut from the cliff itself. The Royal Cult Chapel and Solar Cult Chapel both depicted scenes of the royal family making offerings to the gods. Amun-Ra, the composite creator/sun god, is featured prominently in the Solar Cult Chapel with Hatshepsut and her immediate family kneeling before him in honor. Hatshepsut was the daughter of Thutmose I (1520-1492 BCE) by his Great Wife Ahmose. Thutmose I also fathered Thutmose II (1492-1479 BCE) by his secondary wife Mutnofret. In keeping with Egyptian royal tradition, Thutmose II was married to Hatshepsut at some point before she was 20 years old. During this same time, Hatshepsut was elevated to the position of God’s Wife of Amun, the highest honor a woman could attain in Egypt after the position of queen and one which would become increasingly political and important. Hatshepsut and Thutmose II had a daughter, Neferu-Ra, while Thutmose II fathered a son with his lesser wife Isis. This son was Thutmose III (1458-1425 BCE) who was named his father’s successor. Thutmose II died while Thutmose III was still a child and so Hatshepsut became regent, controlling the affairs of state until he came of age. In the seventh year of her regency, though, she broke with tradition and had herself crowned pharaoh of Egypt. Her reign was one of the most prosperous and peaceful in Egypt’s history. There is evidence that she commissioned military expeditions early on and she certainly kept the army at peak efficiency but, for the most part, her time as pharaoh is characterized by successful trade, a booming economy, and her many public works projects which employed laborers from across the nation. Her expedition to Punt seems to have been legendary and was certainly the accomplishment she was most proud of, but it also seems that all of her trade initiatives were equally successful and she was able to employ an entire nation in building her monuments. These works were so beautiful and so finely crafted that they would be claimed by later kings as their own. Hatshepsut’s name remained unknown for the rest of Egypt’s history and up until the mid-19th century CE. When Thutmose III had her public monuments destroyed, he disposed of the wreckage near her temple at Deir el-Bahri. Excavations in the 19th century CE brought these broken monuments and statues to light but, at that time, no one understood how to read hieroglyphics – many still believed them to be simple decorations – and so her name was lost to history. The English polymath and scholar Thomas Young (1773-1829 CE), however, was convinced that these ancient symbols represented words and that hieroglyphics were closely related to demotic and later Coptic scripts. His work was built upon by his sometimes-colleague-sometimes-rival, the French philologist and scholar Jean-Francois Champollion (1790-1832 CE). In 1824 CE Champollion published his translation of the Rosetta Stone, proving that the symbols were a written language and this opened up ancient Egypt to a modern world. Champollion, visiting Hatshepsut’s temple, was mystified by the obvious references to a female pharaoh during the New Kingdom of Egypt who was unknown in history. His observations were the first in the modern age to inspire an interest in the queen who, today, is regarded as one of the greatest monarchs of the ancient world. How and when Hatshepsut died was unknown until quite recently. She was not buried in her mortuary temple but in a tomb in the nearby Valley of the Kings (KV60). Egyptologist Zahi Hawass located her mummy in the Cairo museum’s holdings in 2006 CE and proved her identity by matching a loose tooth from a box of hers to the mummy. An examination of that mummy shows that she died in her fifties from an abscess following this tooth’s extraction. Although later Egyptian rulers did not know her name, her mortuary temple and other monuments preserved her legacy. Her temple at Deir el-Bahri was considered so magnificent that later kings had their own built in the same vicinity and, as noted, were so impressed with this temple and her other works that they claimed them as their own. There is, in fact, no other Egyptian monarch except Ramesses II (1279-1213 BCE) who erected as many impressive monuments as Hatshepsut. Although unknown for most of history, in the past 100 years her accomplishments have achieved global recognition. In the present day, she is a commanding presence in Egyptian – and world – history and stands as the very role model for women that Thutmose III may have tried so hard to erase from time and memory. Source: Ancient History (www.ancient.eu), Wikipedia (en.wikipedia.org). The temple that the Greeks called the Memnonium in Abydos, actually dedicated to Seti I, Osiris and Isis along with Ptah, Ptah-Sokar, Nefertem, Re-Horakhty, Amun, and Horus, is one of the major archaeological sites in that region. It was begun by Seti I and finished by his son, the great Ramesses II. In fact, this structure built of fine white limestone is actually one of the most impressive religious structures in Egypt. The present facade of the Temple was once the backdrop to the second of the two courtyards, the first of which, along with its entrance pylon, have long since fallen into ruin. The temple, in the shape of an L, once had a landing quay, a ramp, a front terrace, two pylons, though the outer one is mostly lost, with two courts and pillared porticoes, followed by two hypostyle halls and seven chapels, with additional chambers to the south making up the short leg of the L. Storage chambers fill the area from the southern wing to the front of the temple. The main body of the temple was symmetrical back to the seven chapels. While the L shaped floor plan of this temple is unusual, analysis seems to show that the southern wing was no afterthought, but the result of a well thought out alternative to the usual axial temple plan. The outer pylons and courts, as well as the first hypostyle hall which is relatively shallow and has two rows of twelve columns with lotus bud capitals, were hastily completed and decorated by Ramesses II. In fact, an image of him worshipping his father, along with Osiris and Isis is incorporated into the initial decorations. Most of the decorations completed by Ramesses II are inferior to those done during his father’s reign, but some are interesting and noteworthy, including the depiction of him as a young boy roping a bull with his father (elsewhere in the temple). Here, we also find a number of military scenes (second courtyard). Within the first hypostyle hall, it is interesting that Ramesses II placed decorations over those of his father. Within the portico that leads to the hypostyle halls, there was once seven doors that gave way to seven processional paths through the towering clustered columns to seven chapels at the rear of the temple. Even though Seti’s place in history was overshadowed by his son, Ramesses II , arguably one of the greatest pharaohs in Egyptian history. Yet, Seti was an important character in his own right, as he was one of the pharaohs who had to bring order back to Egypt and re-establish Egyptian sovereignty over its eastern neighbours (Syria and the Levant) following the social disruption caused of Akhenaten’s religious reforms . 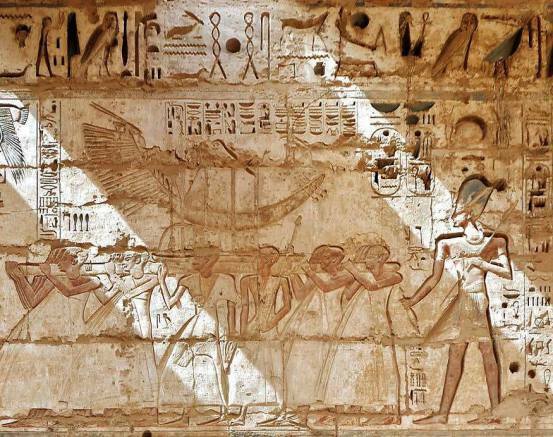 Seti was also responsible for commissioning the construction of a grand temple in Abydos. Abydos has a special place in the sacred landscape of ancient Egypt, as it was believed to be the place where Osiris was buried. Thus, Abydos was an important cult centre for Osiris. A number of temples dedicated to Osiris, all of which were located in one area, were built prior to the reign of Seti. The Temple of Seti, however, was built on new ground to the south of the said temples. 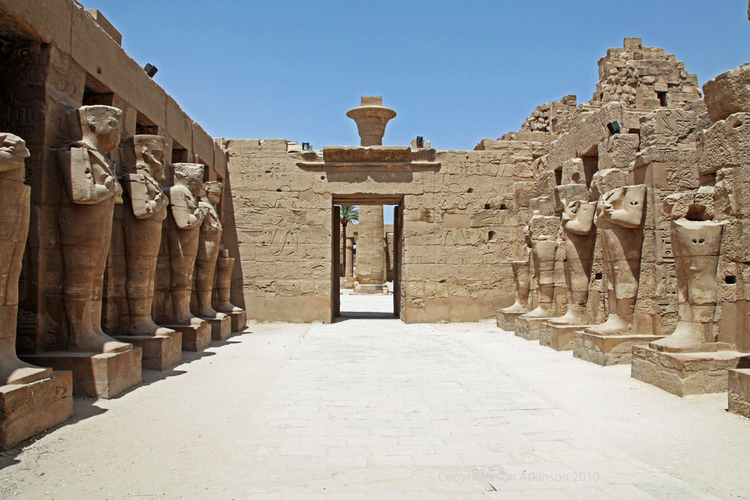 The Temple of Seti played an important role in his family’s claim as a legitimate royal household. 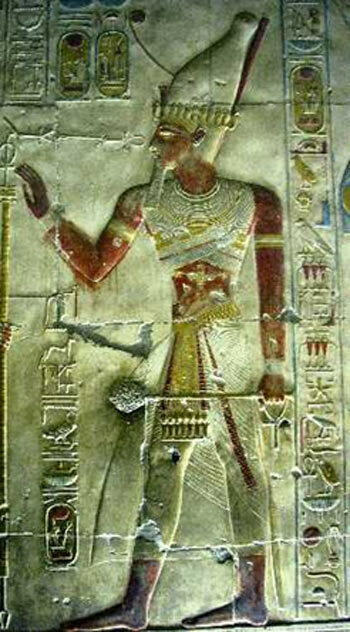 Prior to the ascension to the throne by Seti’s father, Ramesses I, Seti’s ancestors were merely warriors, generals at most. Without royal blood in his veins, Seti had to consolidate his position, and one of the ways to do so was to build temples. 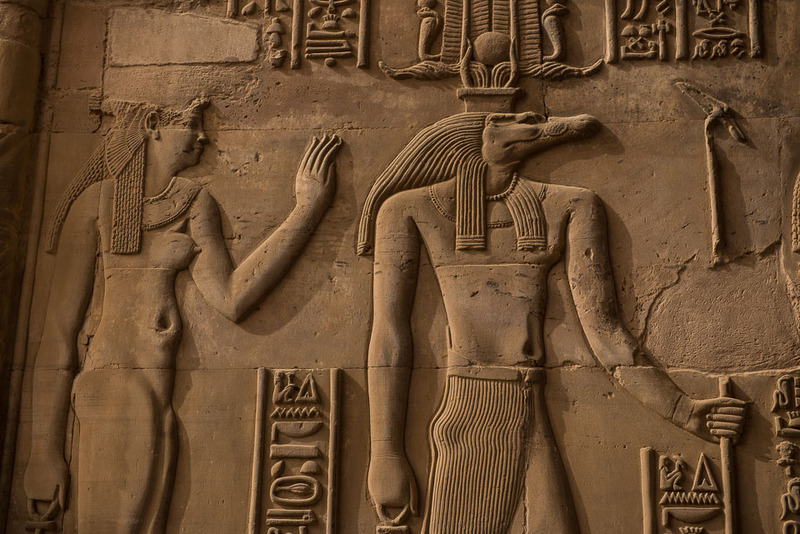 As Akhenaten’s religious reforms did away will the old gods, Seti’s dedication of his temple to Osiris and other important Egyptian deities symbolised a return to the traditional way of life, thus allowing himself to be seen as a restorer of order. Sources: Tour Egypt (touregypt.net), Ancient Origins. (ancient-origins.net). The Temple of Kom Ombo is an unusual double temple in the town of Kom Ombo in Aswan Governorate, Upper Egypt. It was constructed during the Ptolemaic dynasty, 180–47 BC. Some additions to it were later made during the Roman period. The building is unique because its ‘double’ design meant that there were courts, halls, sanctuaries, and rooms duplicated for two sets of gods. The southern half of the temple was dedicated to the crocodile god Sobek, god of fertility and creator of the world with Hathor and Khonsu. Meanwhile, the northern part of the temple was dedicated to the falcon god Haroeris, also known as Horus the Elder, along “with Tasenetnofret (the Good Sister, a special form of Hathor or Tefnet/Tefnut) and Panebtawy (Lord of the Two Lands).” The temple is atypical because everything is perfectly symmetrical along the main axis. The texts and reliefs in the temple refer to cultic liturgies which were similar to those from that time period. The temple itself had a specific theology. The characters invoked the gods of Ombos and their legend. Two themes were present in this temple: the universalist theme and the local theme. The two combine to form the theology of this temple. The temple was started by Ptolemy VI Philometor (180–145 BC) at the beginning of his reign and added to by other Ptolemys, most notably Ptolemy XIII (51–47 BC), who built the inner and outer hypostyle halls. The scene on the inner face of the rear wall of the temple is of particular interest, and “probably represents a set of surgical instruments.” A temple was already built in the New Kingdom to honor these gods, however, this site gained in importance during the Ptolemaic Period. Little remains of the New Kingdom temple. Much of the temple has been destroyed by the Nile, earthquakes, and later builders who used its stones for other projects. Some of the reliefs inside were defaced by Copts who once used the temple as a church. All the temples buildings in the southern part of the plateau were cleared of debris and restored by Jacques de Morgan in 1893. The word “Kom” in Arabic means the small hill and the word “Ombo”, in the Hieroglyphic ancient Egyptian language, means the gold. Therefore, the word Kom Ombo, as a whole, means the hill of the gold. The word Ombo was actually originated from the Pharaonic word “Nbty” which is an adjective derived of the word Nebo that meant gold. During the Coptic period, the word was slightly changed to become Enbo and when the Arabic language became common in Egypt, the word became “Ombo”. 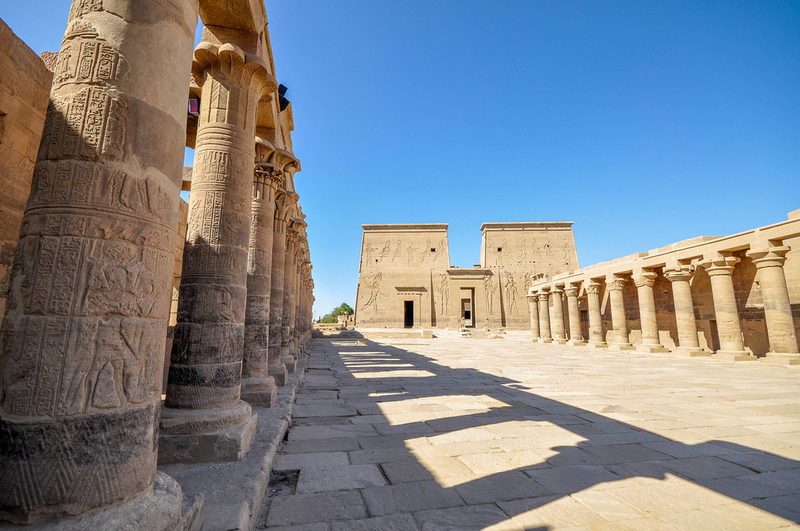 Although Kom Ombo is famous today due to the Temple that was constructed during the Greco Roman era, the area was inhabited since the pre-dynastic period of the Egyptian history and many ancient burial sites were discovered in and around Kom Ombo. The name of the town; Kom Ombo, or the hill of the gold clarifies how important it was for the ancient Egyptians from the economical aspect, despite the fact that the town never really flourished except when the Ptolemies took control of Egypt. The Ptolemies have constructed many permanent military bases in the area situated on the Red Sea. This developed the commercial activities between the town located near the Nile and these bases, especially Kom Ombo which was a transit point where many trading caravans used to stop. The most glorious days of Kom Ombo came when the Romans ruled over Egypt as it became the capital and the administrative center of the province and during this period a large portion of the Temple of Kom Ombo was constructed and many other sections were restored and renovated. The Temple of Kom Ombo, which we view today and was built during the Greco Roman period, was constructed on the ruins of a much older temple which was called “Ber Sobek” or the house of the god Sobek. This older temple was erected during the reigns of King Tuthmosis III and then during the ruling period of Queen Hatshepsut, whose marvelous temple is still standing in the West Bank of Luxor, and both belonged to the 18th dynasty of the New Kingdom. The recent temple of Kom Ombo was built during the period from 205 till 180 BC in the ruling period of King Ptolemy V. The construction process of the temple went on for many years afterward in the period from 180 till 169 BC with each king having his addition to the complex of the Temple of Kom Ombo. 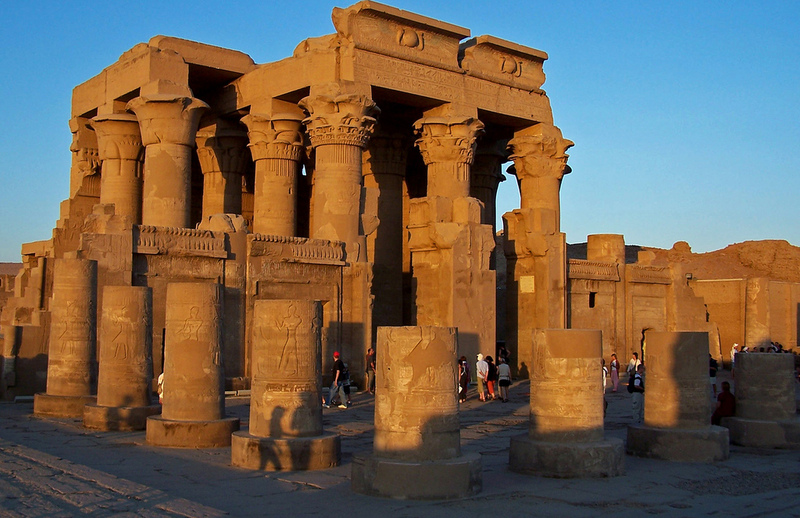 A large portion of the Temple of Kom Ombo, including the hypostyle hall, was constructed during the reign of Emperor Tiberius, from the year 81 till 96 BC. The buildings work of the temple went afterward for more than 400 years during the ruling period of Emperors Caracalla and Macrinus till the middle of the 3rd century AD. The Ptolemies have constructed the Temple of Kom Ombo for the worship of two gods, Sobek; the Crocodile god, and Horus, the falcon god. This is why the complex mainly consists of two parallel temples with all the traditional components of such ancient Egyptian religious structures are present in the two temples. The Temple of Kom Ombo was constructed mainly with limestone in the shape of a rectangle, with a plan and a design which is quite similar to many temples constructed in the Greco Roman period like the Temples of Dendara and Philae which are considered among the most important monuments in Upper Egypt, visited by numerous tourists. The design of the Temple of Kom Ombo starts with a front courtyard, a hypostyle hall following it, three inner halls, and then two sanctuaries; one dedicated to Sobek and the other to Horus. A set of steps lead from the ground to the gate of the temple, which consists of a large structure made of blocks of stones. The façade of the Temple of Kom Ombo has some of the wonderful wall carvings of the Ptolemaic kings beating the enemies and presenting the offerings to the gods. After passing through the gate of the temple, the guest enters the hypostyle hall, constructed in the Roman period, which is largely ruined and damaged due to several reasons with time passing by. The courtyard of the temple consists of a rectangle open space with sixteen columns surrounding the courtyard from three directions. Unfortunately, only the bases of these columns survived until today with some of the capitals that were located at the top of the columns. 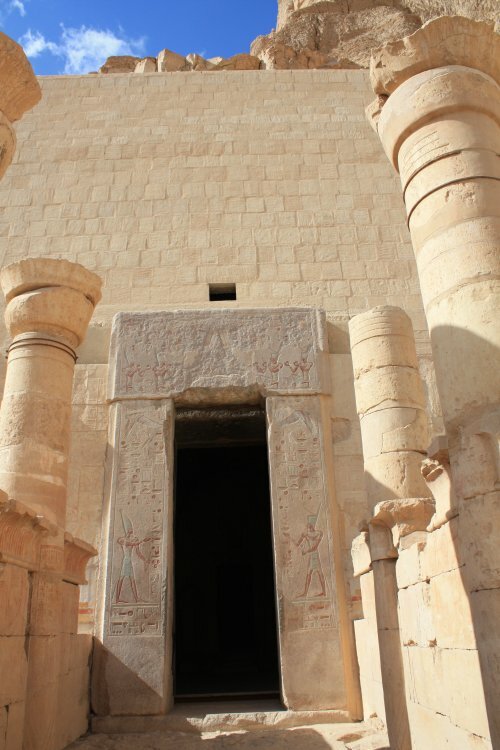 After the courtyard, the guests enter the first inner hall that was constructed during the ruling period of Ptolemy XII. To the East of this hall, there are many portraits of the Ptolemies being purified by the gods Sobek and Horus, in a scene that would be found in other temples like the Edfu and Philae. The inner hall of the Temple of Kom Ombo has a design which is similar to the outer hall but the columns here are quite shorter and the stone capital of these columns have the shape of the lotus flower, one of the most important and sacred plants in ancient Egypt. The Temple of Kom Ombo is featured for having two sanctuaries dedicated to the two gods of the temple; Sobek and Horus. 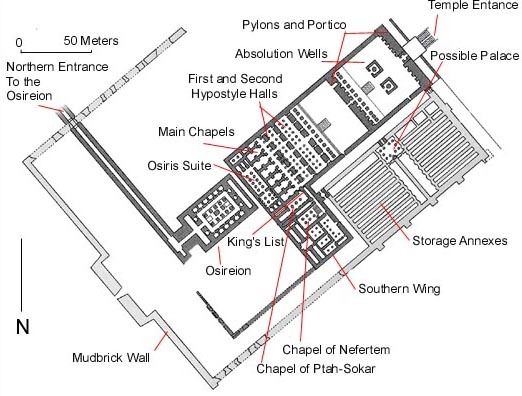 The two sanctuaries consist of two similar rectangle halls which are considered to be among the most ancient sections built in the temple as they were constructed during the reign of Ptolemy VI. The birthplace of the Temple of Kom Ombo is located in the South Eastern section of the complex and it was constructed during the period of Ptolemy VII. This structure consists of an outer courtyard that leads into a front hypostyle hall that leads in turn to another two halls where rituals of the birth of the son of the gods were carried out. The Chapel of Hathour is located in the North Eastern section of the Temple of Kom Ombo and it consists of a rectangle shaped chapel constructed higher than the ground and reached through climbing some steps. The chapel is 5 meters long and 3 meters wide. Inside the chapel of Hathour, there are three glass galleries that display three mummies of crocodiles representing the god Sobek. The façade of the chapel has a portrait displaying Hathour sitting in front of the entrance. Situated in the North Eastern section of the temple of Kom Ombo, a Roman-style chapel constructed in the 3rd century AD was dedicated to the god Sobek. Emperor Caracalla is portrayed on two columns that dominate the entrance into the chapel that hosts many portraits of the god Sobek, which was worshiped by many Egyptians during the Ptolemaic and Roman periods. Temple outside view image source: flicker.